In looking around blogland and seeing some lovely sites, I realize that certain kinds of style catch my eye. I have decided to create an award for the special sites which, in my opinion, have it ALL together. Not only are their projects great, but the blog owner has taken the time to make sure the overall blog design is good. This includes spelling, layout, color scheme, titling and pictures. Here is the award. I will be on the lookout for more award recipients in the future. If your blog (or someone else's) is excellent, please let me know. I will also be creating more awards, specific to certain kinds of achievements. I'd love to hear from you. 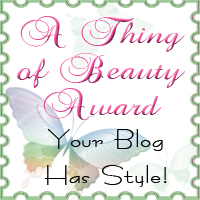 Brag a little about your blog, or congratulate someone's blog that's deserving of an award! One small request. It's not a rule, but I would very much appreciate a link back to my blog attached to the award badge when you display it on your site (after choosing all five of your faves). Thanks so much! I have kept the requirements few and simple so that people will not feel it is a chore to accept the award. It is meant to be fun and encouraging! But since there are only five recipients each time, select them thoughtfully and carefully. Up Late 2 Create! Tereesa always has a delightful colour scheme. Daily Grace Creations Donna and Peggy always have a lot of fun going on at their site. Paperie Petals A very clean and attractive looking blog. Selma's Stamping Corner A lovely site and beautiful cards. Yvonne's Great cards and other lovely paper crafts. It was hard to make just one comment about each of the above blogs. Please take a few minutes to visit each of these recipients' blogs. You'll find inspiration there, for sure! I only like antiques if they are pretty; not all beat up and scruffy. Hate the grunge look. I play piano and sing. Another favourite thing of mine is writing poetry, verses, song lyrics. I'd like my garden to be bigger and have the beautiful roses I used to be able to grow. What I love about cardmaking is that my mind can wander into another world where there are no worries; only flowers, birds, music and creativity. I always think about the special person I am creating each card for, and that makes me happy. I'm looking forward to hearing from you. So tell me about your favorite blogs and let's keep the encouragement going! Grace - thank you so much for stopping by and leaving such a sweet comment and presenting me with your darling award! Thank you so much!! Thank you so much for the award, Grace! I feel truly honored to recieve this. Thanks!! Oh My Goodness, Grace. What a lovely award. We am so honored to be one of the first recipients. We will strive to continue to be worthy of it. Thank you so much. A friend passed on your "Thing of Beauty Award" to me. Thank you for such a nice creation. Sometimes a not so good day is made a Terrific day by a great compliment like this. Hello, Grace!! What a sweet award a friend (Sylvia) passed to me! Had to come visit! What a lovely place to be this AM. If you looked around my blog at all, you saw my daughter, Jillian--her middle name is Grace--love it!! (We continue to work on an attitude worthy of the name!! She's "fire-y"!!) (LOL). I have enjoyed my visit! Thanks for creating the award--have a great day!! Thank you Grace for creating such a lovely award! Peggy at Daily Grace Creations graciously gave the award to me! I feel honored to be a recipient of your beautiful award!